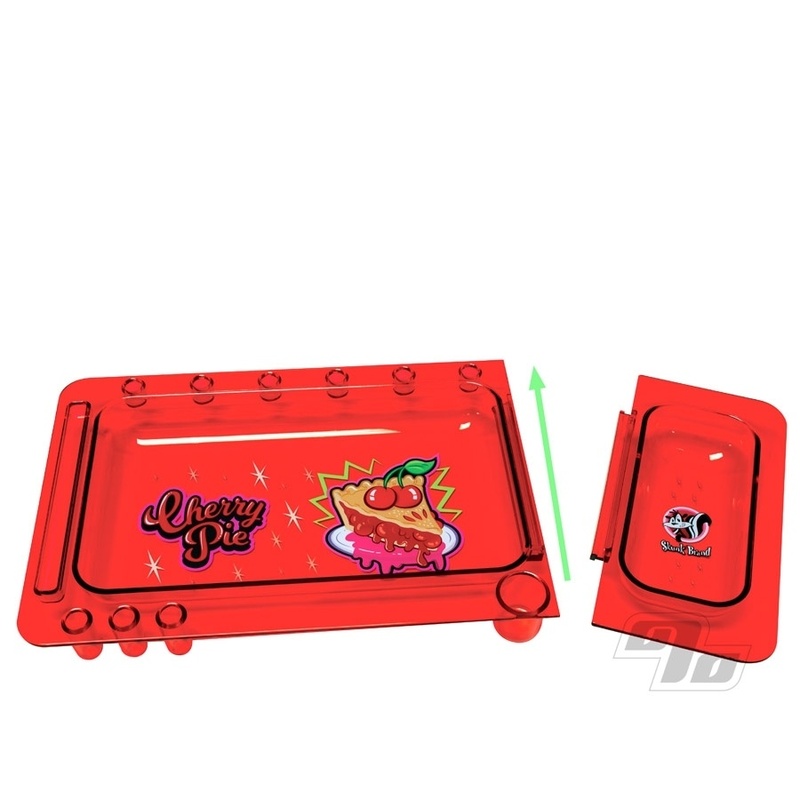 The Skunk Rolling Tray in translucent Cherry Pie red, is a multi-functional rolling and smoking tray. Complete with a removable, smaller tray, this tray from the maker of the original RAW rolling trays, is a must to make rolling at home or on the go easier. Use the larger section of the rolling tray to roll your smokes like normal, while the smaller tray can slide out so you can use it as a mini travel tray or even as an ashtray. Small holders run along the top and bottom edge of the tray are there to hold anything from your pre-rolled cones, hand-rolled smokes, rollies, tips, and wraps; even dab tools. A larger holder at the bottom is perfect for either a Clipper lighter or even up to an 18mm flower bowl. Slit on the left side holds up to a King Size pack of your favorite Rolling Papers. A place for everything! Of course, these Skunk Brand rolling trays make working with all sorts of rolling papers and cones easier including the new Skunk Hemp Cones and/or the popular Raw Natural Cones. Fully assembled, the Skunk Brand Cherry Pie Rolling Tray comes in at 12" x 6 1/4" while the detachable mini rolling tray measures 3 1/8" x 6 1/4" on it's own. If you think this rolling tray design looks a little familiar, it's because it is. These (now) translucent trays are almost identical to the earlier Cookies Rolling Trays; the same manufacturer behind Skunk Brand made trays for Cookies too so it's all good.